Now, this was the James Bond I’ve been waiting for. Or, more accurately, I didn’t know there would be a James Bond quite like this. “Skyfall” might be the first time since “You Only Live Twice” that Bond has “died” before the opening credits. 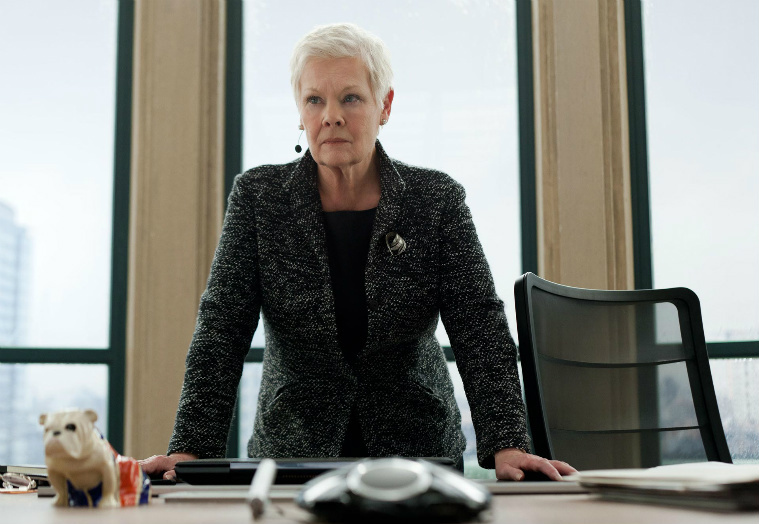 A failed mission to get a hard drive containing a very secret list of names sends Bond hurdling off a train and into a river, leaving M (Judi Dench) to write Bond’s obituary. Before the train chase there is a motorcycle rooftop chase that is both implausible and impossible not to be thrilled by. The very best Bond moments make the implausible so much fun. After a fantastic opening credit sequence, Bond is found hiding on a tropical island. Craig’s Bond might be the most reckless Bond yet, so much so that he’ll even play drinking games with a scorpion. Unlike most exiled heroes, Bond doesn’t seem to miss his job. That is, until he sees a news report about a terrorist attack at M16 headquarters that effects him personally, despite being out of the job. The revisionist James Bond of the 21st century is not motivated merely by a duty to defeat the bad guys; this Bond also has a strong emotional compass. Once we know that the actor is good, there is always the expectation that the character of James Bond will be awesome. However, it is rare that a Bond film produces a truly memorable villain. That is until they cast Javier Bardem as hacker terrorist Silva. Bardem has pretty much cornered the market on creepy villains in modern film. While Le Chiffre of “Casino Royale” was dark and frightening in a realistic way, Silva is cheesy in the best sense of the word. He is entertaining to watch because he is so unpredictable. We might know where he will go, but how he will get there is impossible to know. Bardem plays him with the exaggerated movements of a Broadway dancer. Here is a villain who is as interested in causing anarchy as he is in putting on a show. In that aspect, he is a perfect movie villain. “Skyfall” might be the first time that a “Bond Girl” didn’t have significant screen time. I would argue that M is the Bond Girl of “Skyfall.” It makes sense, as the plot becomes largely about protecting her. It is also interesting to see a Bond film that is more about the development of a friendship than about the development of a romance. 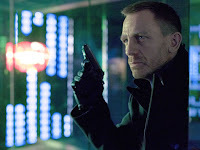 Bond and M have a very complicated relationship, as M is not above sacrificing an agent in order to complete a mission. It is this kind of character work that has made the past few Bond entries some of the strongest in the 50 year history of the series. “Skyfall” is brought to life by director Sam Mendes. Mendes has directed some smaller scale action flicks (“Road to Perdition,” “Jarhead”), but never anything on this scale. Mendes has done with James Bond what Christopher Nolan has done with Batman. Mendes brings a lot of his artistic sensibility to the table and makes the cities more than just giant action set pieces: they are living, breathing, and stunning places. The opening throws us relentlessly into the center of a bazaar. Bond has never stared so pensively at the London skyline. Shanghai is brought to life with beautiful colors and then becomes the stage for an amazing fight consisting only of silhouettes. I have yet to go to Shanghai*, but it looks something like the way “Blade Runner” imagined Los Angeles to look like in 2019. While “Skyfall” may be the funniest Bond yet, there is a constant, dark shadow of death that hangs over it from the very beginning. It is as if Bond’s whole way of life is in more danger than ever before. “Skyfall” may be the most thematically rich Bond film ever made. It truly questions the place of a spy made for the Cold War in the modern age when anyone can get a computer and become a hero or a terrorist. This is probably the most self-aware Bond as well. It is an eloquent and deep territory to explore, but it is almost ruined at several times by overstatement. As a director, Mendes’ Achilles’ Heel has always been subtlety. He seems afraid to let a theme come across organically, so he feels a need to hammer the audience over the head with it. They ask, “are we still relevant with technology?” so many times that by the end, it almost loses all value. However, the surprising amount of innovation in this theme saves “Skyfall” in the end. Anyone upset about the lack of technology in “Skyfall” clearly hasn’t seen Daniel Craig with a shotgun. “Skyfall” is both a throwback to James Bond of the past and a radically new Bond as well. It includes a few surprises that will be most meaningful to die hard fans. It also peppers in some backstory that makes the Bond legend so much stronger. But overall, this is just the best action movie I have seen in ages. For every plant there is a payoff and for every explosion there is a reason. “Skyfall” shows how smart Bond and the other agents are. Getting Bond as far away from technology at the end was a pretty ingenious move on the writers’ part. Modern blockbusters never forget the eye candy, but they often neglect to make their heroes actually seem intelligent. I believe a Bond without jetpacks or invisible cars is the best Bond there is. The question of whether Bond is still relevant is actually pretty meta, and questions whether after 50 years, Bond films are still necessary. I think the answer is yes. James Bond has become something of a constant to me, and no Thanksgiving ever feels as awesome when there is no new Bond film to look forward to. It’s also great to think that whatever existential fear is currently haunting the collective subconscious (nuclear war, terrorism, cyber attacks), James Bond will always be there with his Walther PPK to stop it. *Between “Looper” and “Skyfall,” Shanghai has gotten a glorious portrayal this year in film. 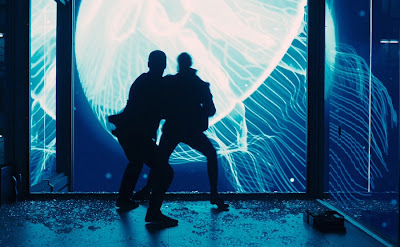 This entry was posted in 007, British, Daniel Craig, James Bond, Javier Bardem, Judi Dench, Movie Review, Naoime Harris, Ralph Fiennes, Shanghai, Skyfall on November 26, 2012 by ian0592.